When last we met The Robins… they weren’t The Robins. In fact when last we met them they were singing as the second credited name to Johnny Otis on a song that Otis wrote for the Excelsior label and now, just a month later, they’re singing as the headliners on a song they wrote themselves for Score Records. Back in April these four men were making their recording debut, among the many hopefuls to come along recently who dreamed they might actually beat the odds and have a career in this field, maybe something which lasted as many as three or four years before having to face reality and take regular jobs in run-of-the-mill professions. Yet when the group finally saw their recording career come to an end a full thirteen years had passed making them among the more successful acts to emerge in 1940’s rock ‘n’ roll. That must’ve been a pretty heady month they had by the end of May 1949 to set them off on such an unlikely course. Arguably the most fascinating figure in rock history, at least the name who had the broadest career in terms of active roles he pursued, was Johnny Otis. His recording output alone is one of the most prolific and iconic of his era but that merely was the tip of the iceberg when it came to the ways in which he left his mark. He also excelled as a songwriter for others, a producer, a talent scout, a radio dee-jay and TV host (while still a current performer in the 1950’s no less), and most crucially in terms of how he developed, as a nightclub owner which is how and where he discovered so many of his charges in the early years, including this group. Otis’s most inspired idea was to use all of these acts within his own loose aggregation of performers when he began recording in 1948. Eventually down the road they were simply dubbed “The Johnny Otis Show” on the record labels themselves, their parts individualistic but interchangeable in a way as they were all merely part of a larger concept. It was meant to replicate the nightclub experience where you’d have all sorts of artists on stage, each with their own spotlighted performance, but all combining for the greater good of the show. Since Johnny wasn’t yet a vocalist on record, though in a few years he’d add singing to his long list of credentials too, this tactic also helped him release a steady stream of records that were far more diverse than had he stuck to simply trying to be the focal point of each one as a bandleader. Because of this approach to date he’s featured scalding sax workouts (Barrelhouse Stomp) courtesy of Big Jay McNeely, scintillating guitar pyrotechnics (Midnight At The Barrelhouse) with Pete “Guitar” Lewis taking center stage and comedy skits presented from both the male (Court Room Blues) and female (Alimony Boogie) perspectives (that would be Lem Talley and Cathy Cooper respectively). In other words, Otis’s diverse résumé was becoming his calling card. But he STILL had yet to find permanent vocalists to better appeal to the primary record buyer who expected to hear good singers delivering straightforward songs. Thus these four guys – Ty Terrell and brothers Roy and Billy Richard who’d arrived at his club as The A Sharp Trio, and Bobby Nunn who came to the same place as a solo act – were combined to create a group Otis hoped might compete with The Ravens, the top rock vocal group in America. Nunn was a deep voiced lead in the manner of Jimmy Ricks and like Ricky he had a good understanding of the subtexts of a wide array of material. For their first effort – My Baby Done Told Me – Otis had given them the name The Four Bluebirds which they didn’t particularly like, so after it came out they changed it to The Robins, a name they’d keep until the group ended its run in the early 1960’s. 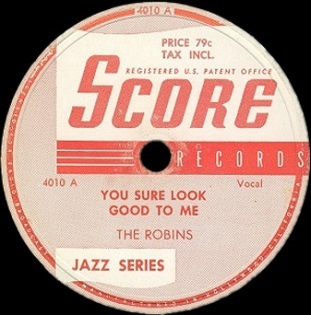 Since they were just essentially sessionists for that release they went looking for their own record deal, independent of Johnny Otis, which is where we find them today, at one of the more notable Los Angeles independent labels, Aladdin Records, for whom they cut a standard four song session the last week in May, launching their career in a proper sense. The first thing you may notice is that this DIDN’T come out on Aladdin, presumably just to make everybody’s lives today a bit more confusing. Instead the Mesner brothers put it out on their Score subsidiary which they’d just got off the ground that month. Okay, I suppose that makes some sense, you need new artists to make a new label take shape after all, but what makes no sense is that a few weeks later their second release would come out on the primary Aladdin label. But that’s the boring particulars just to explain the goings-on surrounding this record which is the primary concern here, their first chance to show the type of act they envisioned themselves to be and it’s in that sense that You Sure Look Good To Me makes its strongest impression. We’re seeing the gradual shift in emphasis towards a younger point of view when it comes to the now three most prominent vocal groups in rock, though it’ll take a little longer for The Robins to reach that stage and truth be told they won’t ever be at the same level as either The Ravens or The Orioles. When The Ravens broke through in late 1947 they were still just in their early 20’s. Jimmy Ricks, their leader, was just 23 years old, but they’d been on their own and seeking to establish themselves as professional singers since the end of World War Two. By 1946 they started recording for Hub Records, working regularly in nightclubs where they were gaining notice for their unique vocal approach and had acquired a veteran manager. In other words they were already fully immersed in the adult world of jobs, responsibilities and careers, so despite their young age their outlook was somewhat more mature. This came across to a degree in their music. Though their STYLE certainly had all of the elements of youthful bravado and cutting edge sensibilities working in its favor, their material to a large degree was similar to that of older established acts. Their goals, the yardsticks of success they were striving for, were also representative of an older tradition – high class bookings which required the ability to handle standards for instance. So while their work on record included stuff that was decidedly ahead of its time, rock records through and through which appealed quite naturally to the up and coming fans who made up that audience, they were also conversant in the musical realities of the era that was just passing. The Orioles by contrast were amateurs when they first burst onto the scene, having just formed as a result of performing talent shows at local Baltimore venues and their rise from struggling novices to hit-makers came so fast – a grand total of four months – that they didn’t have time to acquire the polish and professionalism the slightly older Ravens had. Likewise their more naked vulnerability on record, the uncertainty their songs projected, their ragged harmonies behind Sonny Til’s emotional leads were even more in line with the rock fan’s own sensibilities and as such connected them to their audience in a way that propelled them to stardom. They seemed far younger than The Ravens, even though the age difference was just a year in the case of Ricks and Til. But even though The Orioles had the image of being a young group not much different in outlook than those buying their records, they still were adhering to some of the same old record business truisms about having a well-rounded repertoire to be able to appeal to the middle-age audience who was still perceived to be the most reliable barometer of long term success. As such a lot of their releases played to that older constituency and while it wasn’t nearly as successful, it didn’t deter them in the least from continuing to seek their stamp of approval. The youth movement suddenly had found its voice. Although it was true that they were slightly younger than their aforementioned bird group counterparts, The Robins weren’t exactly just entering puberty here. Bobby Nunn, their lead singer, was just five weeks younger than Sonny Til and though the others were a couple years behind, Ty Terrell and Billy Richard were both just twenty and Roy Richard was five months away from joining them, they all were at least out of school themselves by this point. But their experiences weren’t that far removed from that reality and so not surprisingly that’s what they drew from when crafting their own song, something which The Ravens did only occasionally and The Orioles not at all, another factor which had further shifted the perspective to more adult concerns for those groups since it was primarily adults who were composing for them. 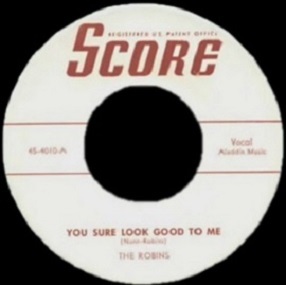 The interesting thing here though is while it was perfectly suited for The Robins, their generation and rock ‘n’ roll in general, You Sure Look Good To Me was actually a rendition of a song cut two years earlier by The Big Three Trio featuring legendary bassist/producer Willie Dixon. You wouldn’t think the subject matter would be something a group like that would tackle but they approach it in much the same way. You can tell what The Robins saw in it however, beyond just how appropriate the youth oriented perspective. For starters the melody is altogether simple, but catchy, the changes are by the numbers and the harmonies are basic. It’s something you can easily envision any group of fairly talented kids sitting around singing as they pass a bottle between them on a Friday night. Nunn’s deep voice quasi-lead gives it an air of somber gravity as he recounts his doomed crush on a girl he passed on his way to school. That the two apparently never hook up, just two ships passing in the night, or in the crosswalk as it were, is another reflection of their inexperience in life. Nothing actually happens here, it’s not certain they even talk, he very well could simply be recounting this for his buddies in homeroom later that morning, embellishing it somewhat by pretending to have asked her these questions, but since no responses are forthcoming it’s likely he was merely thinking them to himself as he stared in awestruck wonder as they passed. Yet even that makes this sound more authentic than it’d have been had they managed to swing a date with this girl, for if there’s one thing that all who pass through these years understand it’s how your uncertainty in these situations has to be overcome for you to truly come of age. The straightforward arrangement is actually a benefit here as it allows their one slightly unusual quirk – that of the group singing the lead lines together and having Nunn merely echo them before providing the coda to each stanza, hence the “quasi-lead” comment earlier. The group’s blend is nice, nothing spectacular but slightly mesmerizing all the same thanks to their languid pace capped by sustained notes which works their way into your consciousness. You can’t say it sounds menacing, especially since the lyrics are anything but ominous, but there’s definitely an edgy undercurrent to how they deliver this, as if they’re a little sharper characters than typical high schoolers. Juvenile delinquents they might not be, but the seeds of that prototype could probably be uncovered here with a little scratching on the surface. The accompaniment is so skeletal that unless you’re really straining to pick it out it’ll just blend into the overall sound. There’s a piano that keeps busy in the distance, some rudimentary drumming to maintain a sense of rhythm and a few electric guitar licks which add to ambiance without standing out too much. Nicely done, but hardly with the emphasis that you’d come to expect in a short while with these kind of acts. On top of that there’s no instrumental solo break, no vocal bridge even for that matter, just the perfunctory chorus reappearing once more. In that way You Sure Look Good To Me comes across almost like a form of meditative chanting, something they did on their own for solace when confronting their lack of a romantic relationship rather than a performance for the benefit of those listening in. Though it’s hardly anything to get excited about and there’s not too much here to suggest they were poised to break through with any sales or acclaim, it’s also too endearing to merely pass off as non-essential. The youthful perspective is what makes it notable, that and the fact it lets us in on the ground floor of The Robins story, but beyond that it gives a vague impression that there’s something stirring in the vocal group corner of the rock world that might be worth keeping an eye on. Not a hit, not much more than an historical curiosity owing almost entirely to their future success, but well worth hearing in its own right even if The Robins had never gotten airborne down the road. If you’d said this one charted, I wouldn’t have been surprised. There’s not a lot to this one, but what’s here is done darn well. Bobby Nunn’s trailing lead is probably the most inspired thing about this record (that technique still doesn’t show up very often). I don’t know who’s backing the fellas, but the band also did a solid job (especially the steady bassist). For whatever reason, I’ve never really been into the Robins. I know they’re important and they’re responsible for the existence of one of favorite acts, the Coasters. Regardless, maybe you can help win me over to their side. Side-note: I’ve always loved the phrase “I loved you before I learned to call your name.” That’s one of those lines you ONLY hear in music (and never seriously spoken) just for the purpose of scansion. Leave a reply on "The Robins: “You Sure Look Good To Me”"